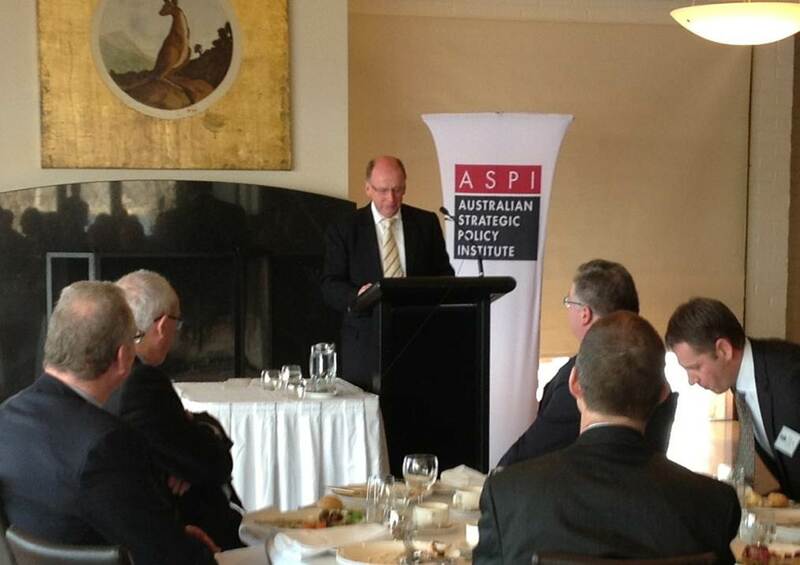 ASPI today hosted a lunch address by Mr David Gould  (PDF) in the DMO. It wasn’t the first public address on the subject of Australia’s current and future submarines by DMO’s General Manager Submarines, but it was certainly the most thorough to date. What follows is my take on the main messages in the speech and Q&A which followed—if it’s not in quotes, don’t blame Mr Gould. The talk began with the recent past with a discussion of the Collins fleet. Current availability of the Collins was described as a significant improvement on the ‘intolerable levels of the late 2000s’, with three boats available to Navy much of the time—an improvement of about 50% on last year and ahead of interim targets. The long-term aim is for three to always be available, with a fourth available at short notice if required. Those numbers are consistent with the international benchmark identified in the second Coles report —which I estimate to be a little under 1,200 days of availability a year . The caution on that good news is that things might get worse again before stabilising in 2016–17, as the shortfalls in maintenance over the past decade are progressively overcome. But even that decline isn’t guaranteed, as improved reliability of the boats due to (long overdue) changes in the assignment of responsibility in engineering decisions and the way in which spares are managed should see taxpayers getting better value from each submarine. It might seem surprising that what’s often reported as fundamental design problems can be ameliorated through what amounts to changes in management practices but that’s what the first Coles report  (PDF) told us—nine and a half out of ten major findings  were failures of governance. Turning to the future submarine, things naturally got much less clear. That’s to be expected from a project that’s only recently began receiving the resources required to start serious work on the concept design and systems testing required to firm up the structure of the project and allow for serious decisions sometime down the track. The plan at the moment is to use the next couple of years to complete and evaluate concept designs. That includes the first real estimates of costs, not only of the boats themselves, but also the work that needs to be done to develop the tooling and infrastructure required for the project. Note the word ‘real’—it’s worth mentioning that the oft-quoted $36–40 billion that Sean Costello and I first estimated back in 2008  was based on historical trend data, not on any evaluation of the likely design. Then, as now, there was simply no design to evaluate. Hopefully, that won’t be the case by 2015. But, as a word of caution, even those estimates won’t be definitive—as the AWD project has shown us, that’ll only come on contract signature. During Q&A, the Canberra Times’ Nic Stuart, asked if the future submarine was necessarily going to be a very large one capable of operating in the wider Pacific theatre. The answer, reasonably enough, was that ‘in order to meet the requirements articulated in the 2009 and 2013 Defence White Papers, the future boat would almost certainly need to have additional reserves of buoyancy and power compared to the Collins’—which would almost certainly lead it to being larger. But it’s the ‘in order to meet the requirements…’ part of the answer that I worry about. As I’ve written many times, taking demanding requirements as set in stone and then pursuing them is a recipe for a project in which cost and schedule estimations are especially fraught. As Augustine  (Norman, not Saint) tells us, ‘the last 10% of the performance sought generates one-third of the cost and two-thirds of the problems’. Chasing even greater operational performance than Collins will inevitably see us again pushing the limits of conventional submarine design. If you ask him now, I think Chief of Navy would say that the requirements are what he needs to do the job. But he might think differently if the pursuit of those requirements impacted on the resources available for the frigates that will replace the Anzac and Perry class. And if he doesn’t, the chief of one of the other services might if Army’s future mobility vehicles or Air Force’s combat fleet come under the pump. In a world where the Defence Capability Plan got whatever resources were required to meet the requirements identified, such a top-down approach would be fine—but we don’t live in that world, and a crunch must come if spending isn’t increased . What Defence and government must do is to take the results of the scoping work underway and test where the balance of cost, risk and effort sits between the various options. Only then, when we have a sense of the trade-offs involved, can we sensibly talk about the operational parameters that are worth pursuing . Cost-benefit analysis has never been fashionable in military planning, but in a resource constrained environment, it’s a necessary evil.